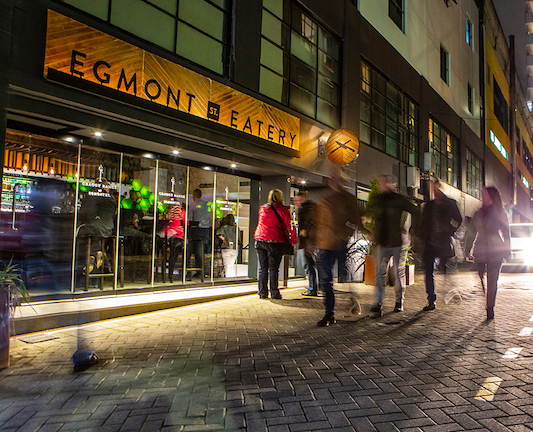 Egmont St. Eatery is a hidden gem tucked away in one of Wellington's vibrant laneways. What used to be an old industrial carpark has been transformed into a modern, multi-level, light-filled eatery. Our food reflects the season, with a focus on quality products and bold flavours. Dinner features an exciting array of dishes designed to be shared amongst friends or to be enjoyed individually, with a selection of salads and sides as accompaniments. Lunch service is more casual with an interesting selection of salads, sandwiches and individual meals. We also have a very popular breakfast and brunch offering, and a beautiful selection of baked goods and sweet treats in our cabinet to top it off. 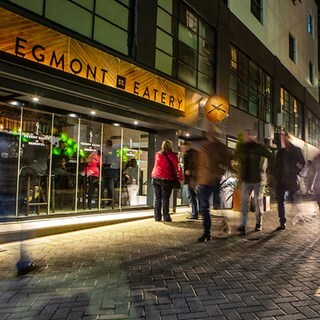 The food is complimented by quality caffeine, a selection of bespoke cocktails, wines and craft beer, and always service with a smile. We are open for breakfast and lunch 7 days and for dinner 5 nights a week. Our restaurant operates on split levels. The lower dining area features more traditional low seating chairs and tables, whilst the upper dining area includes high-top tables and stools. During dinner service, the lower dining area is available to book in sittings between 5:30pm and 6:30pm and then from 8:00pm onwards. Please note bookings maybe made up to 3 months in advance, please email [email protected] for other dates, private / semi-private hire options and any other queries.